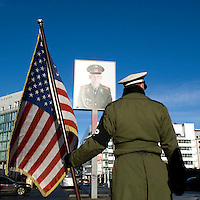 Twenty years on, little is left of the Berlin Wall. 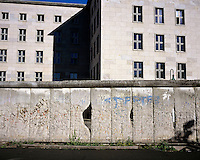 Most of the structure was dismantled in the immediate aftermath of its opening in November 1989. Those parts that remained became a magnet for souvenir hunters, and chunks of its concrete are now on display in dozens of diverse locations around the world. The wall's symbolic power has not diminished. Its usefulness as visual shorthand for the geopolitical struggles of the 20th century is such that fragments can be found in the libraries of no fewer than six US Presidents - Roosevelt, Kennedy, Nixon, Ford, Reagan and Bush Senior - as well as in the men's bathroom of a casino in Las Vegas. A first-time visitor to Berlin today can struggle even to form an impression of where the wall stood and how the city was divided. After twenty years of supercharged urban development much of the city centre is unrecognisable. Besides some isolated fragments and a few watchtowers that are still standing, only three large sections of the wall remain: the East Side Gallery near the Oberbaumbrucke at the river Spree, an 80 metre stretch at the site of the former Gestapo headquarters not far from Checkpoint Charlie, and the reconstructed section at Bernauer Strasse which was turned into a memorial in 1999. 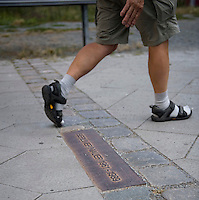 Stefan Boness traced the route of the wall in search of those parts that remain as clues to the city's past.